Because of the complex nature of the foot, it is subject to a wide variety of conditions. Tendonitis—An inflammation of the tendon. Although this term is used often, most cases of tendinopathy are not associated with significant inflammation. Tendinopathy is generally the result of overuse or repetitive motion. The strain on the tendon causes tiny tears in the tissue that accumulate over time. A sprain is a stretch or tear of a ligament. Ligaments bind bones to one another. Sprains can be caused by overstretching a ligament during activity, or it can occur during a traumatic injury, such as a fall. They vary in severity, up to and including a complete tear. Fractures are broken bones. They can occur during athletic activity, be the result of a fall, or a traumatic accident. Fractures also occur as a result of conditions that weaken bones, such as osteoporosis . The severity of the fracture depends on the type and location of the break. Infections that occur on the skin or in soft tissue can spread to the bones if left untreated. Infections that affect the foot can be bacterial, fungal, viral, or parasitic. Organisms can enter the body from a break in the skin as a result of a scratch, cut, or ulcer. People with diabetes have to be especially careful of any wound or injury to their feet. Signs of infection include warmth, redness, drainage, and discomfort. Diabetes—People with diabetes have an increased risk of foot ulcers and neuropathy , a serious condition in which nerve function is reduced, creating less sensation. Neuropathy may also cause a chronic burning or tingling sensation. Osteoporosis—A reduction in bone mass may cause fractures in the foot or ankle. Arthritis —Joint pain and inflammation which can affect one or both sides of your body. Gout —A build up of uric acid crystals in one or several joints causing pain and inflammation. The most common joint affected is the big toe. Corns and calluses are thickened layers of skin. They are caused by irritation. The corn is usually cone-shaped and has a knobby core that points in. This core can put pressure on the thin skin under it and cause sharp pain. Corns can develop on top of or between your toes. Soft corns develop between your toes. They are kept flexible by the moisture from sweat. Calluses develop on the bottom of your foot. Corns and calluses develop as a result of friction from the toes rubbing together or against the shoe. Calluses can also develop anywhere on the foot. Note: If you have diabetes, having calluses is a strong sign of future ulceration, especially if you have a history of foot ulcers. Contact your doctor. Bursitis is an inflammation of the fluid-filled sacs that protect your toe joints, particularly the big toe. It often occurs as a result of irritation from rubbing. A bunion is a painful swelling. It is the result of the movement of the base of the big toe away from the smaller toes. At the same time, the end of the big toe moves toward the smaller toes. This may cause the head of the metatarsal bone to stick out and rub against the side of your shoe. The tissue under it becomes inflamed. A painful swelling forms. Bone growth may occur at the site of irritation. A hammertoe is a permanent deformity of your toe joint. With hammertoe, your toe bends up slightly and then curls downward, resting on its tip. When forced into this position long enough, the tendons of your toe contract and it stiffens into a hammer, or claw-like, shape. 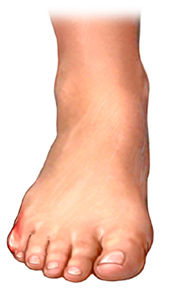 A hammertoe is most common in the second toe. However, it may develop in any or all of your 3 middle toes if they are pushed forward in a shoe and do not have enough room to lie flat. Hammertoes are often caused by wearing shoes that are too short. Morton neuroma is the most common neuroma of the foot. It develops when the metatarsal bones in the middle toes pinch the nerve that runs between them. 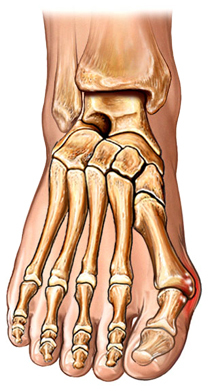 A stress fracture in your foot usually occurs in one of the five metatarsal bones. It is most common in the second or third. These fractures are caused by overuse during strenuous exercise, particularly running and other high-impact aerobic sports. Sesamoiditis is a condition involving the sesamoid bones. These are small bones under the head of the first metatarsal bone (at the base of the big toe). The sesamoid bones carry a great amount of weight. The bones and tissues around them can become inflamed and irritated. Sesamoiditis injuries are common among people who do high-impact activities. These include ballet dancing, running, and aerobic exercise. When a cause cannot be determined, any pain in the ball of the foot is generally referred to as metatarsalgia . It is most likely caused by poor footwear or by high-impact activities. People with a high arched foot are more likely to develop metatarsalgia. Tarsal tunnel syndrome results from compression of a nerve that runs through a narrow passage. It goes behind your inner anklebone down to your heel. It may be caused by injury to your ankle, such as a sprain or fracture. It may also be caused by a growth that presses against the nerve. Pronation is the normal motion that allows your foot to adapt to uneven walking surfaces and to absorb shock. When you have too much pronation, the outside your foot turns upward. This flattens your arch. It also stretches and pulls the fascia. It can cause foot pain. It can also affect the way you walk. This can lead to problems in the hip, knee, and lower back. The heel is the largest bone in the foot. Heel pain is the most common foot problem. It can occur in the front, back, or bottom of the heel. Plantar fasciitis occurs from small tears and inflammation in the plantar fascia. 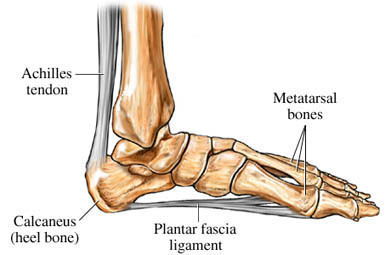 The plantar fascia is a ligament-like structure that stretches from the heel to the ball of your foot. It supports the arch of your foot and helps to serve as a shock absorber. Plantar fasciitis is usually a result of overuse during high-impact exercise and sports, especially running. Because the condition often occurs in only one foot, factors other than overuse may be responsible in some cases. Other factors that may increase the risk of this injury include obesity, tight calf muscles, poorly fitting shoes, or an uneven stride. 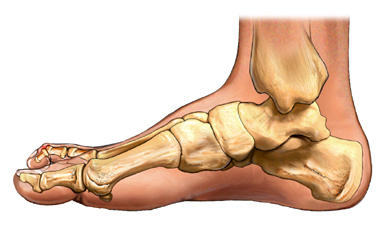 Pain is often mainly around the undersurface of the heel. It often spreads to your arch. The condition can be temporary. It may become chronic if you ignore it. Resting usually provides relief. The pain may return. Heel spurs are bony growths that stick out from the bottom of the heel bone. They are parallel to the ground. The spur occurs where the plantar fascia attaches. The pain in that area is due to irritation of the attachment. There is a nerve that runs close to this area and may contribute to the pain which occurs. There are many people with heel spurs who have no symptoms at all. Haglund deformity is a bony growth on the back of the heel bone. It irritates the bursa and the skin behind the heel bone. It is commonly called a "pump bump." It develops when the back of your shoe repeatedly rubs against the back of the heel. This irritates the bursa and skin that is over the bone. Achilles tendinopathy is degeneration of the tendon that connects your calf muscles to your heel bone. There are two common types of tendinopathy: tendinosis and tendonitis. Tendonitis is an inflammation of the tendon. Although the term tendonitis is used more often, tendonopathies are more likely to be a tendinosis, with no inflammation. The tendon suffers excessive stress and internal injury. A small area undergoes degeneration. Small internal tears may develop. Achilles tendinosis occurs mostly in people who do high-impact exercise, particularly running, racquetball, and tennis. People with calf muscle tightness are at more risk. A stress fracture can occur in the heel. It is caused by overuse during strenuous exercise, particularly running and high-impact aerobics. Stress fractures are common in military training. Flat feet is a defect of your feet that eliminates the arch. The condition is most often inherited. However, arches can also “fall” in adulthood. This condition is sometimes referred to as posterior tibial tendon dysfunction (PTTD). This occurs most often in women over 50, but it can occur in anyone. Overall, normally occurring flat feet in adults do not cause many functional problems. An overly high arch can cause problems. This is also known as cavus foot. The cavus foot is much less common than the flat foot. Arthritis of the foot and ankle. Ortho Info—American Academy of Orthopaedic Surgeons website. Available at: https://orthoinfo.aaos.org/en/diseases--conditions/arthritis-of-the-foot-and-ankle/. Updated March 2015. Accessed February 7, 2018. Gout. EBSCO DynaMed Plus website. Available at: http://www.dynamed.com/topics/dmp~AN~T115215/Gout . Updated March 27, 2017. Accessed February 7, 2018. Hallux valgus and bunion. EBSCO DynaMed Plus website. Available at: http://www.dynamed.com/topics/dmp~AN~T115604/Hallux-valgus-and-bunion . Updated November 22, 2017. Accessed February 7, 2018. Hammer toe. EBSCO DynaMed Plus website. Available at: http://www.dynamed.com/topics/dmp~AN~T114646/Hammer-toe . Updated March 30, 2015. Accessed February 7, 2018. Joint pain in the foot. Foot Health Facts—American College of Foot and Ankle Surgeons website. Available at: http://www.foothealthfacts.org/what-is/ns%5Fjoint-pain.htm?terms=foot%20pain. Accessed February 7, 2018. Heel pain. Ortho Info—American Academy of Orthopaedic Surgeons website. Available at: https://orthoinfo.aaos.org/en/diseases--conditions/heel-pain/. Updated October 2017. Accessed February 7, 2018. Pes planus. EBSCO DynaMed Plus website. Available at: http://www.dynamed.com/topics/dmp~AN~T114291/Pes-planus . Updated September 26, 2017. Accessed February 7, 2018. Stress fractures. Ortho Info—American Academy of Orthopaedic Surgeons website. Available at: https://orthoinfo.aaos.org/en/diseases--conditions/stress-fractures/. Updated October 2007. Accessed February 7, 2018.